Digital print, foam-x panel, EL wire inlay in flocked ornate frame. 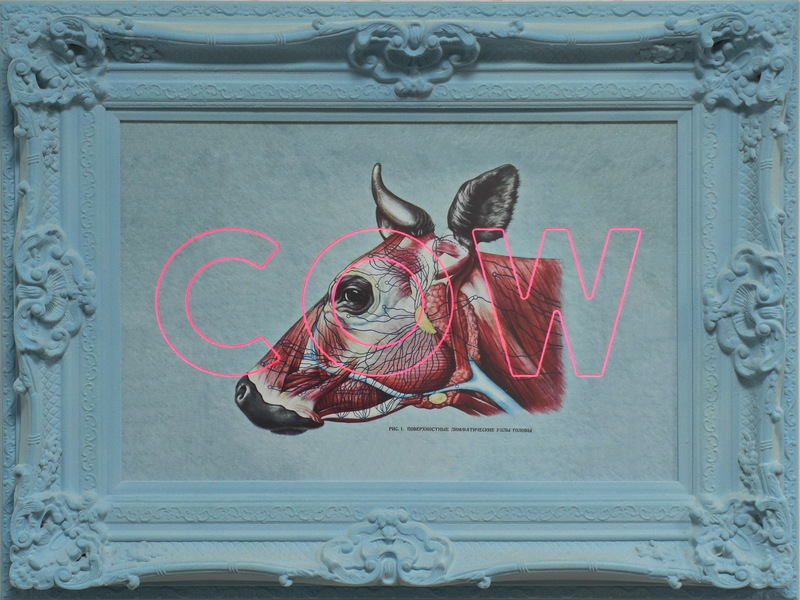 Cow In Cow we explore unconventional juxtapositions, the viscerality of the mid-century Soviet veterinary anatomical graphics with the velvety textural qualities of the powder blue flock finish to the ornate rococo style frame. This in turn acts as a chromatic and stylistic counterpoint for the hot pink electroluminescent text executed in a mechanistic industrial font. When seen as a whole, these dichotomous elements coalesce to create a pleasingly harmonious aesthetic.